Burlington, Ontario, November 6, 2017 – EcoSynthetix Inc. (TSX: ECO) (“EcoSynthetix” or the “Company”), a renewable chemicals company that produces a portfolio of commercially proven bio-based products, today announced its financial and operational results for the three months (Q3 2017) and nine months ended (YTD 2017) September 30, 2017. Financial references are in U.S. dollars unless otherwise indicated. Net sales were $4.5 million and $12.9 million for Q3 2017 and YTD 2017, respectively, compared to $2.7 million and $8.6 million in the corresponding periods in 2016. The 65% increase in the quarter was primarily due to higher sales volumes of $1.4 million, or 50%, and an increase in average selling price which positively impacted sales by $0.4 million, or 15%. Increased substitution rates at existing customers represented 26% of the increase in volume while sales to new commercial customers accounted for 24% of the increase in volume. The 49% increase in the YTD period was primarily due to higher sales volumes of $3.4 million, or 38%, and an increase in average selling price which positively impacted sales by $0.9 million, or 11%. Increased substitution rates at existing customers represented 23% of the increase in volume while sales to new commercial customers accounted for 15% of the increase in volume. The increases in average selling prices were primarily due to favourable pricing dynamics. Gross profit was $1.0 million and $2.8 million for Q3 2017 and YTD 2017, respectively, compared to $0.4 million and $1.3 million in the corresponding periods last year. The increases in gross profit were primarily due to higher average selling prices and higher sales volumes partly offset by increases in transportation costs. Gross profit as a percentage of sales was 22.1% and 22.0% in Q3 2017 and YTD 2017, respectively, compared to 15.2% and 15.7% in the corresponding periods last year. Gross profit as a percentage of sales adjusted for manufacturing depreciation was 26.0% and 26.2% for Q3 2017 and YTD 2017, respectively compared to 21.3% and 22.2% for the corresponding periods in 2016. The improvements were primarily due to higher average selling prices. Selling, general and administrative expenses (SG&A) were $1.2 million and $3.7 million for Q3 2017 and YTD 2017, respectively, compared to $1.2 million and $4.4 million for the corresponding periods in 2016. SG&A expenses were flat in the quarterly period as lower discretionary spending was offset by an increase in people related costs. The decrease in the YTD period was primarily due to lower discretionary spending. Research and development (R&D) costs were $0.9 million and $3.3 million for Q3 2017 and YTD 2017, respectively, compared to $0.9 million and $3.1 million for the corresponding periods in 2016. Lower government grants recognized in Q3 2017 were offset by lower discretionary spending. The increase in the YTD period was primarily due to lower government grants recognized in 2017 compared to 2016. Foreign exchange loss was $0.1 million for Q3 2017, compared to a nominal amount in the same period last year. The Company recognized a nominal loss in YTD 2017 compared to a gain of $0.1 million in the corresponding period last year. The change was primarily due to the translation of cash balances denominated in Canadian dollars and exchange rate fluctuations between the Canadian dollar versus U.S. dollar. Adjusted EBITDA loss was $1.0 million and $3.7 million for Q3 2017 and YTD 2017, respectively, compared to a loss of $1.6 million and $5.9 million for the corresponding periods in 2016. The 37% improvement in each of the respective periods was due to higher gross profit and lower operating expenses in the 2017 periods. 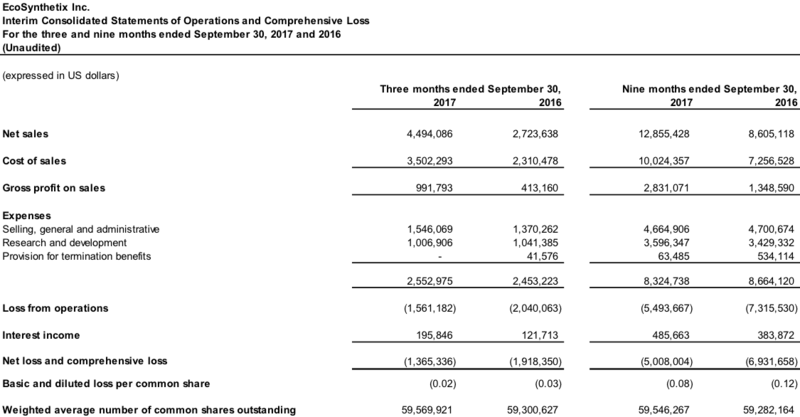 Net loss was $1.4 million, or $0.02 per common share, and $5.0 million, or $0.08 per common share, in Q3 2017 and YTD 2017, respectively, compared to $1.9 million, or $0.03 per common share, and $6.9 million, or $0.12 per common share, for the corresponding periods in 2016. The improvements were principally due to higher gross profits as well as lower operating expenses in the YTD 2017 compared to the corresponding period in 2016. 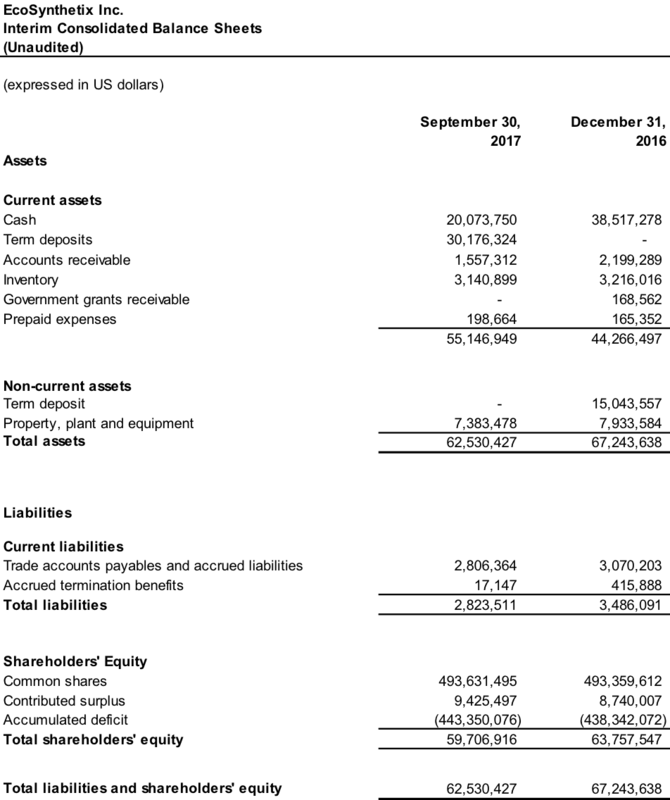 Cash on hand and term deposits were $50.3 million as at September 30, 2017, compared to $53.6 million as at December 31, 2016. Cash on hand at September 30, 2017, excluding the term deposits, was $20.1 million. EcoSynthetix will host a conference call on Tuesday, November 7, 2017 at 8:30 AM ET to discuss its financial results. Jeff MacDonald, CEO, and Robert Haire, CFO, will co-chair the call. All interested parties can join the call by dialling (647) 427-7450 or (888) 231-8191. Please dial in 15 minutes prior to the call to secure a line. A live audio webcast of the conference call will also be available at www.ecosynthetix.com. The presentation will be accompanied by slides, which will be available via the webcast link and the Company’s website. Please connect at least 15 minutes prior to the conference call to ensure adequate time for any software download that may be required to join the webcast. This press release makes reference to certain non-IFRS measures. These non-IFRS measures are not recognized measures under IFRS, do not have a standardized meaning prescribed by IFRS and are therefore unlikely to be comparable to similar measures presented by other companies. Rather, these measures are provided as additional information to complement those IFRS measures by providing a further understanding of results of operations of EcoSynthetix from management’s perspective. Accordingly, they should not be considered in isolation nor as a substitute for analysis of the financial information of EcoSynthetix reported under IFRS. The Company uses non-IFRS measures such as Adjusted EBITDA to provide investors with a supplemental measure of operating performance and thus highlight trends in its core business that may not otherwise be apparent when relying solely on IFRS financial measures. Management also believes that securities analysts, investors and other interested parties frequently use non-IFRS measures in the evaluation of issuers. Management also uses non-IFRS measures in order to facilitate operating performance comparisons from period to period, prepare annual operating budgets and assess the Company’s ability to meet its capital expenditure and working capital requirements. Adjusted EBITDA is not a measure recognized under IFRS and does not have a standardized meaning prescribed by IFRS. See “IFRS and Non-IFRS Measures.” The Company presents Adjusted EBITDA because the Company believes it facilitates investors’ use of operating performance comparisons from period to period and company to company by backing out potential differences caused by variations in capital structures (affecting relative interest expense), the book amortization of intangibles (affecting relative amortization expense) and the age and book value of property and equipment (affecting relative depreciation expense). The Company also presents Adjusted EBITDA because it believes it is frequently used by securities analysts, investors and other interested parties as a measure of financial performance. 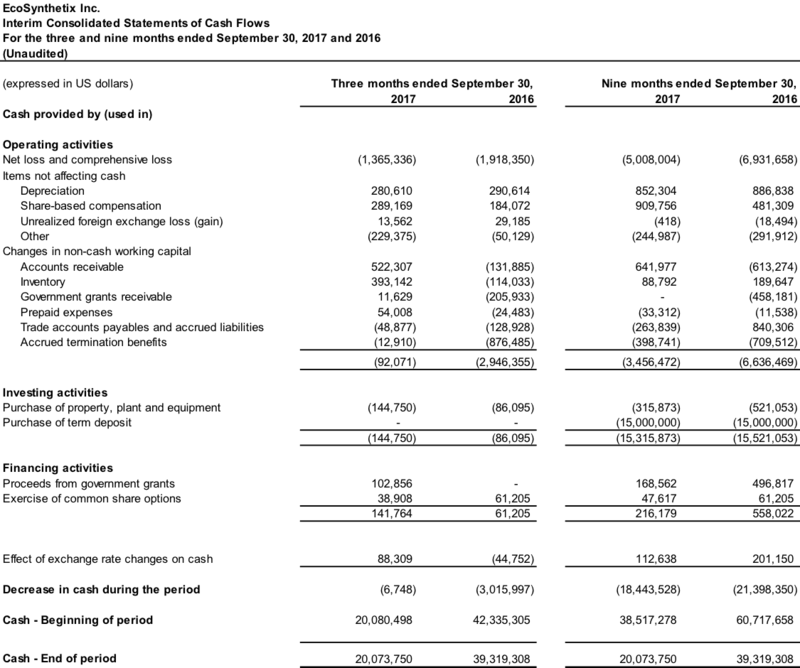 Adjusted EBITDA as presented herein are not recognized measures under IFRS and should not be considered as an alternative to operating income or net income as measures of operating results or an alternative to cash flows as measures of liquidity. Adjusted EBITDA is defined as consolidated net income (loss) before net interest expense, income taxes, depreciation, amortization, other non-cash expenses and charges deducted in determining consolidated net income (loss). Certain statements in this Press Release constitute “forward-looking” statements that involve known and unknown risks, uncertainties and other factors which may cause the actual results, performance, objectives or achievements of the Company, or industry results, to be materially different from any future results, performance, objectives or achievements expressed or implied by such forward looking statements. The forward-looking statements in this Press Release include, but are not limited to, statements regarding the Company’s plans to execute its commercial strategy, convert late-stage industrial trial prospects into customers and expand the number of lines and the volumes at existing customers, and other statements regarding the Company’s plans and expectations in 2017. These statements reflect our current views regarding future events and operating performance and are based on information currently available to us, and speak only as of the date of this Press Release. These forward-looking statements involve a number of risks, uncertainties and assumptions and should not be read as guarantees of future performance or results, and will not necessarily be accurate indications of whether or not such performance or results will be achieved. Those assumptions and risks include, but are not limited to, the Company’s ability to successfully allocate capital as needed and to develop new products, as well as the fact that our results of operations and business outlook are subject to significant risk, volatility and uncertainty. Many factors could cause our actual results, performance or achievements to be materially different from any future results, performance or achievements that may be expressed or implied by such forward-looking statements, including the factors identified in the “Risk Factors” section of the Company’s Annual Information Form dated March 30, 2017. Should one or more of these risks or uncertainties materialize, or should assumptions underlying the forward-looking statements prove incorrect, actual results may vary materially from those described in this Press Release as intended, planned, anticipated, believed, estimated or expected. Unless required by applicable securities law, we do not intend and do not assume any obligation to update these forward-looking statements.